Last weekend at the Orlando Supercross, MDK Motorsports' Nick Wey put a last-lap pass on Makita Suzuki factory rider Ivan Tedesco to claim the last position on the podium. It was his second podium of the season, and it pushed him up in to the top five in the Amp’d Mobile AMA Supercross Series point standings. But unfortunately, if you weren’t in attendance, you didn’t get to see Nick’s pass, as the TV crew was focused on James Stewart’s last-lap victory celebration. So we decided to ask him about it and about his homecoming race this weekend in Detroit, Michigan. Be sure to show Nick and his sponsors some support by clicking on the links at the bottom of the page. 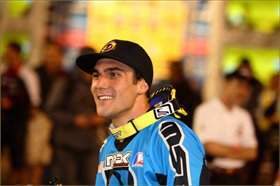 Racer X: Nick, tell us about the last-lap pass on Ivan Tedesco last weekend in Orlando. To be honest, I wasn’t there and there was only a background glimpse of it on TV—they were following James! Nick Wey: Yeah, I was feeling good the whole race coming up through the pack. After the halfway point, I just started to get my groove a little bit. I saw Ivan up there ahead of me, and I just was able to put my head down and put a nice, clean pass on him in the last turn before the finish line. I don’t even think he knew I was coming. Well, congratulations on yet another podium finish. You podiumed earlier in the season at San Francisco, but that was a mudfest. In Orlando, you were flat-out hauling. What’s gotten in to you lately? I’ve just been working hard all year. 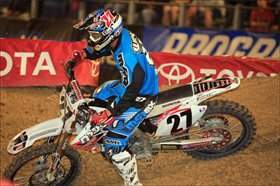 I’ve been working with Randy Lawrence a lot, doing a lot of motos and just trying to work on my speed. The track was pretty tough in Orlando, and I think a lot of guys kind of fell back during the race and I was able to capitalize. Speaking of the tracks, every rider has a different opinion on the difficulty of them. What’s your take? Well, I think the racing is definitely better when they focus on the safety of the track. I think it’s a little easier to race on, for sure. But I think they kind have gone away from even having any whoops a lot of the time because they make them so small. But it seems lately they’ve been coming around and making more whoops again. I’m pretty pumped about how the tracks have been lately. With that podium finish, you passed up Kawasaki’s Michael Byrne in points, and you’re seven points behind Tedesco, who sits in fourth. Is the goal now to pass him in points? Well, my goal is the same, which is just to do the best I can every week. Obviously, if I’m able to beat those guys, I’m going to be happy moving up in the points. I’m just going to keep focusing on each race, and I’m really looking forward to this week’s race. It’s my hometown race and I’d like to podium there. That’d be pretty sweet! Has any of the factory teams approached you about next year? I haven’t really talked to anybody about that. That’s what I have Scott Sepkovic [Crown Management] for, and I’m just going to keep focusing on my results. How stoked is Danny Paladino and the entire MDK team? Yeah, everyone at MDK has been working really hard. Especially when we came together with the Motosport Outlet team, it helped us out a lot, as far as getting more people in to help with the day-to-day stuff back at the shop. I just can’t thank them enough. Let’s talk about this weekend. Are you sad the race is moved from Pontiac? You know what? 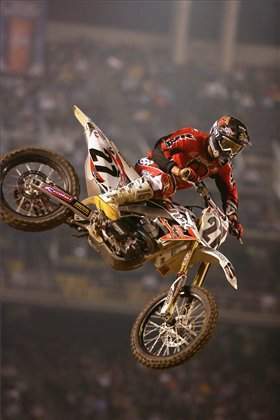 Pontiac has always had amateur races the day after the supercross and I grew up racing that. I can remember racing 50s there, so I’ve grown accustomed to racing at the Silverdome, but I’m also excited to go and check out the new stadium. How far is Dewitt from Detroit? How many ticket requests have you gotten in this past week? [Laughs] Oh, quite a few! I’m blowing up. I’m definitely going to have the entire crew there. The Michigan Mafia going to be representing? Yep, the Mafia and Dewitt’s Hardest will be there. 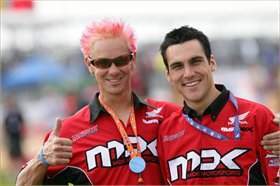 I know Chad Sanner was spinning wrenches for you last year, but he moved on to the SoBe/Samsung Mobile squad. Who’s your mechanic now? Brian Calma, and he’s doing a great job. He’s definitely cool. He’s been with the Motosport team for a couple years, and he was available when we were looking for a mechanic for the team, and everything is working out. He’s definitely been putting in a lot of hours. Thanks, Nick. Get a better start this weekend! Yeah, that’s definitely the plan. As long as I get a better start and get up in there, maybe I’ll get on TV, too.